After shoving the Maple & Bacon Poutine at McDonald's, we walked down to a restaurant next door called St-Hubert, and had 2 kinds of poutines. 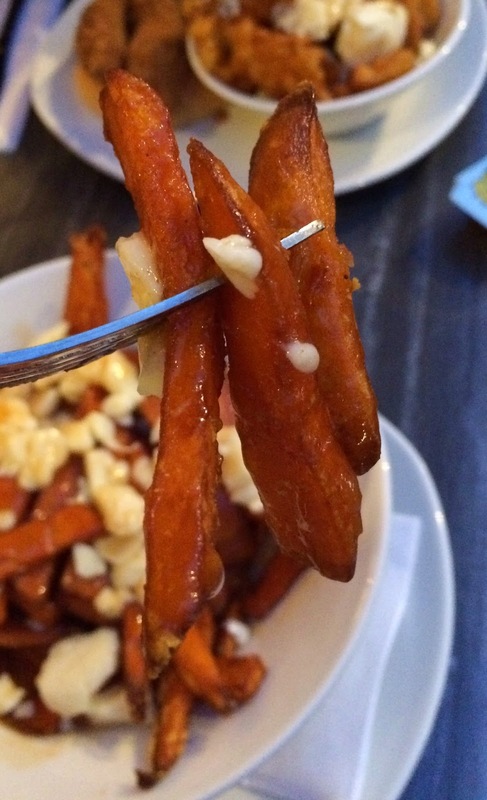 One of them is a classic poutine but instead of regular fries, I asked if they could make it with sweet potatoes. 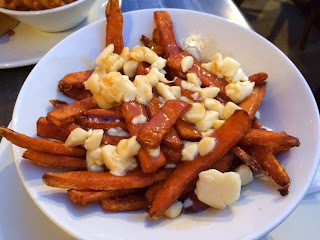 In the menu, I saw a plate served with sweet potato fries in place of regular potato fries with a dollar extra, so I thought they could arrange the same for poutines. And our waitress said of course when I asked her if it's possible, so I got it with sweet potatoes and decided to label this as a secret menu as it's not written on the menu as an option. 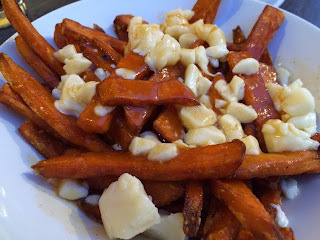 Poutine made with sweet potato. Like regular poutine, there're generous amount of small to large pieces of cheese curds. Fries were reddish orange and some parts were dark brown after being fried. 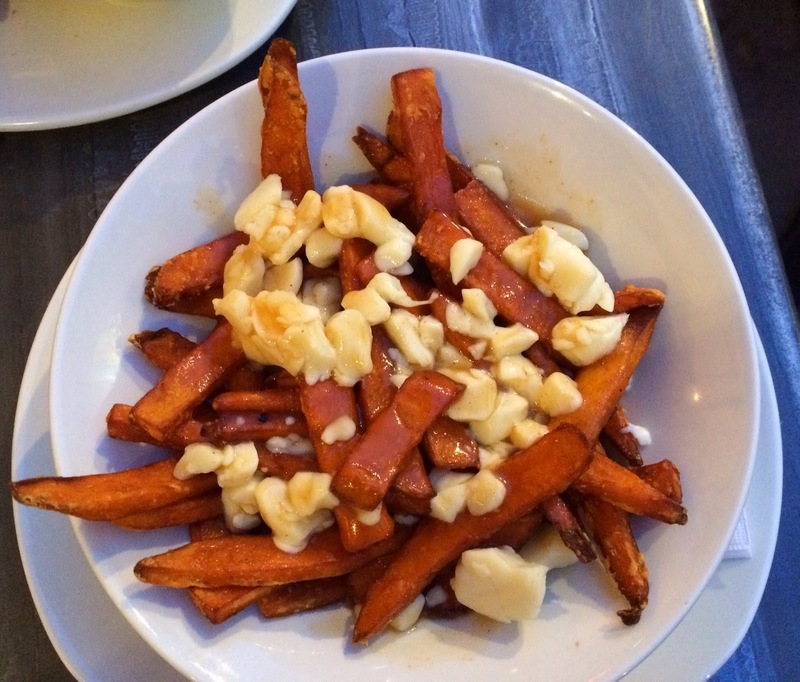 I had a poutine with sweet potato fries from Lola Rosa, but it's mixed with Yukon gold so that it's my first time to have 100% sweet potato poutine. The surface was crispy, the inside was moist and velvety, and they're very sweet. Gravy sauce was light and over the bright fries, the color of the gravy sauce was almost impossible to see. Chunky cheese curds were squeaky and absolutely tasty. I got a bit tired of the sweet flavor, and I think it's better to be shared. I thought it went well with their simple yet flavorful (chicken base) gravy, but a bowl full of sweet potatoes was a bit too sweet. From another restaurant, I had half regular potatoes and half sweet potato mixed, and that's a good balance. Waffle fries might have tasted better if you like the subtly spicy seasoning, but each hole absorbed gravy and they tended to become soggy quicker than regular cut fries.